Hirschl & Adler Galleries, Inc., Neo-Classicism in America: Inspiration and Innovation (New York, 1991), p. 31, no. 15. Peter M. Kenny, Honoré Lannuier: Cabinetmaker from Paris (New York, 1998), p. 166, fig. 95. Tom Armstrong, Amy Coes, Ella Foshay, and Wendell Garrett, An American Odyssey: The Warner Collection of Fine and Decorative Arts (New York, 2001), pp. 26, 206-207. New York, Hirschl & Adler Galleries, Neo-Classicism in America: Inspiration and Innovation, 27 April - 7 June 1991. With dramatically sweeping caryatid figures, this pair of card tables is a powerful expression of New York’s Classical style. From the rounded corners of the top to the narrow turnings on the rear supports and the dynamic shaping to the base, details of these tables replicate the known practices of master cabinetmaker Duncan Phyfe. 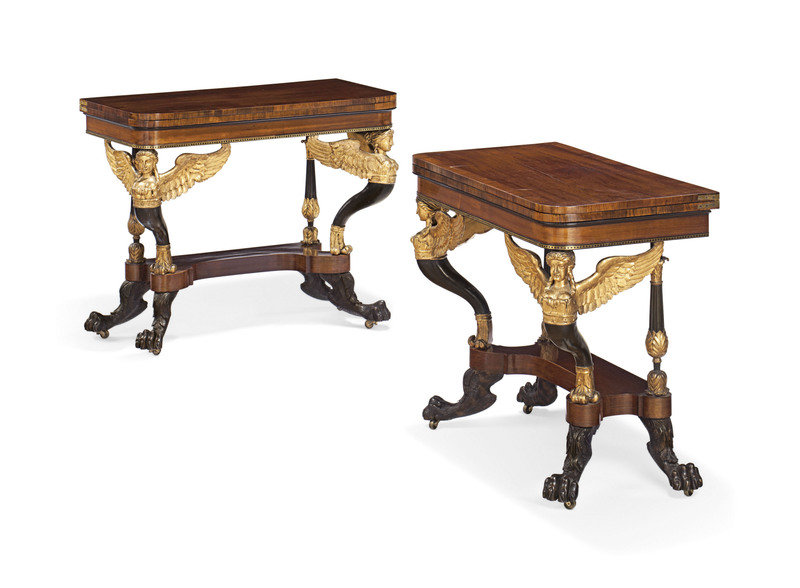 A pair of card tables firmly attributed to Phyfe displays similar figures and turnings, as well as closely related bases and well illustrates the “ornamented Grecian style” adopted by the cabinetmaker in the 1810s (Christie’s, New York, 25 September 2013, lot 101). Representing a departure from Phyfe’s earlier, more delicate forms, the style reflects the influence of published French and English designs as well as the output of his principal competitor, Charles-Honore Lannuier (1779-1819). Sculptural supports on tables played an important role in the design of the new style, but expensive and requiring the talents of a specialist carver, they appear to have been reserved for Phyfe’s more important commissions and survive in relatively few numbers today. The rounded corners design seen on these tables supplanted the earlier canted corner model in New York in about 1820 and was particularly favored in Phyfe’s shop (see Peter M. Kenny and Michael K. Brown, Duncan Phyfe: Master Cabinetmaker in New York (New York, 2011), pp. 79, 200). Diverging from Phyfe’s practices are the carved legs, which are distinguished by their large, bulbous feet. Similar renditions are seen in the work of New York cabinetmaker Michael Allison (Kenny and Brown, op. cit., p. 80, fig. 82). It is possible that the tables offered here illustrate a collaboration between the two makers or perhaps the work of specialist carvers who worked for both Phyfe and Allison.